Some bridges are built of steel and cement. But musician Mike Stevens has built his bridge to remote Aboriginal communities on a foundation of hope, compassion and an innovative idea. 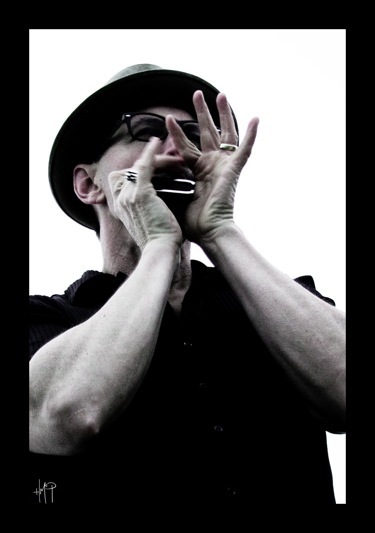 Born in Sarnia, Ontario, Mike is acknowledged as one of the world’s best harmonica players. So accomplished that he has played over 300 times at the Grand Ole Opry, even though the harmonica is considered a fringe bluegrass instrument. In fact, it was virtually shunned in that musical tradition before Stevens’ incredible virtuosity on the diminutive instrument changed all that. In the fall of 1999, Mike and a number of other musicians, accompanied by journalists, arrived in Goose Bay, Labrador on their way to perform for Canadian peacekeepers in Bosnia. During their stopover, they added a show for the local audience. Stevens dedicated a song to some disadvantaged kids he had heard about in a nearby Innu community about 50 kilometers away, down a gravel road. As Mike describes it, “I got a really cold response from the largely white audience.” After the gig, a local newspaper reporter suggested that Mike slip away from the tour for a day to meet the kids and see the community for himself. That visit rocked Mike’s world and ignited a desire in him to connect with the children in these isolated Aboriginal villages through music and art. He realized the kids who lived there were, and still are, largely out of sight, left behind and he wanted to bring hope and inspiration to their everyday life. He stopped in at the school that, like the rest of the community, was dilapidated, with broken windows and dirt floors. But the kids he met there were enthusiastic, smart and loved music. Mike also came upon a group of teens around a bonfire on a street corner, plastic bags filled with gasoline held tightly to their faces, getting high – the bags contracting and expanding with every breath. This was a dangerous situation and Mike knew it. He reached for his harmonica and started to play Amazing Grace while the gas fumes burned his face, inducing a fierce headache. Then an unexpected thing happened. The teens started to chat with him, even asking him questions about his family. A film crew from the tour had also come to the community and coming across this incredible scene, captured it, effectively starting an international conversation about the state of Innu settlements. This astonishing footage is available on Mike’s website and is also the focal point for a documentary about his journey, A Walk in My Dream, that was shown on the CBC Documentary Channel. 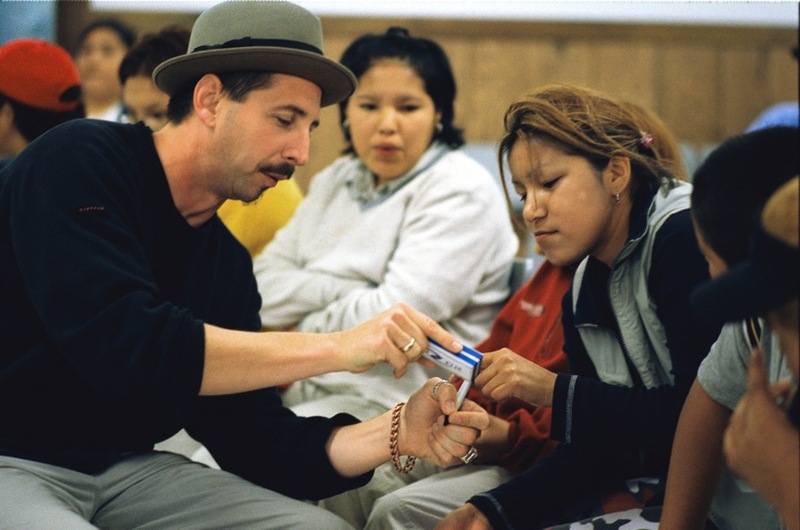 As promised, Mike returned with a suitcase of harmonicas and a mission to share his love of music so that perhaps the kids could find their voices and tell people what they needed. He ran music workshops in the school. In the evening, he would fill the pockets of his parka with harmonicas and wander to the foreboding dark outer limits of the village where the teens were hanging out, getting high. This was no casual walk. He was entering into a war zone. All he had for protection was the sincere interest in wanting to know what these kids were going through and the peace offering of a pocket-sized mouth harp. He would start to play and the kids would be dumbfounded at the sight of this outsider – and disarmed by his music. He’d hand them a harmonica and the first tentative span of that musical bridge would be set in place. He returned often, always bringing musical instruments with him. Mike was committed and the youngsters who had been let down so often by programs and initiatives, could see that he was different. They could trust Mike. Even so, it took two years for some of the kids to make eye contact. By 2002, news of Mike’s extraordinary effort inspired other musicians and artists to ask if they could help. With a flood of donations and instruments, and interest from artists to help out, Mike and a group of well known music industry players based in Toronto set up a nationally-registered charity called ArtsCan Circle. More communities were added and the approach was refined based on what worked. 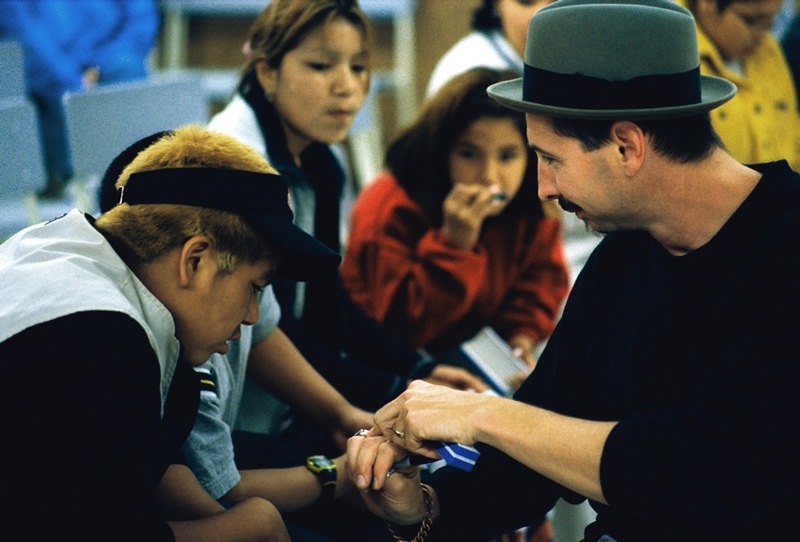 The mission remained the same: to encourage the self-esteem of Aboriginal youth in isolated Canadian communities through a cooperative exploration of the arts. And every artist who signs on with ArtsCan is a volunteer. True to Mike’s promise, ArtsCan Circle continues to fulfill its commitment to return every year for as long as it takes for local arts programming to take root in a community. In that first community in Labrador, it has taken a more than a decade to achieve that goal. Now there are 11 communities in Ontario, Quebec and Labrador where ArtsCan Circle teams are actively visiting. The goal is to increase that number as funding allows. As online technology develops, ArtsCan Circle is looking to add remote mentoring to the mix, enabling local coordinators from the community to support and inspire the young people. The program is paid for by house concerts, individual gifts, some government program support and lots of in-kind support. 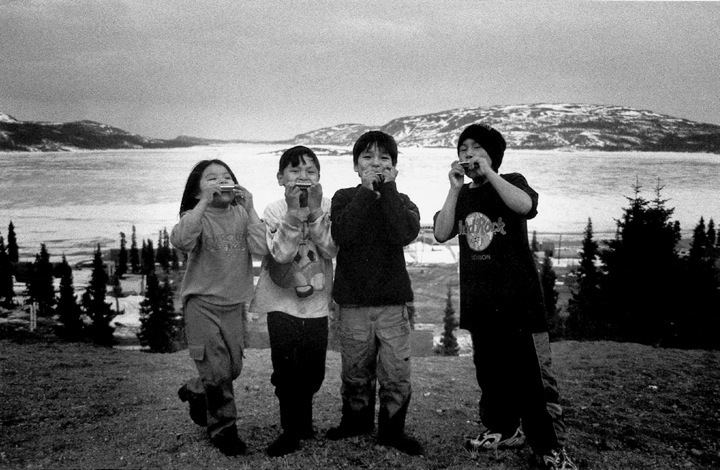 You might think that much has changed in 13 years in remote Aboriginal communities in Canada. And to be fair, some things have. But the prospects for youth in too many places are grim and the pace of change glacial. Some of these communities have the highest teen suicide rates in the world, with teenage girls accounting for more than 50 percent of these deaths. That’s why ArtsCan Circle continues to exist. Professional artists like Mike volunteer for these tough assignments because they experience firsthand what it means to the young people they work with. The communities often lack the most basic resources so for many children this is the first arts mentoring program of any kind that they have experienced. The effort also means a great deal to their parents, elders and teachers. In each of these communities, music, art and theatre has become a way for youth to voice their experiences and feelings in a language others can understand – and need to hear. Their art is authentic and powerful. They have much to say and we have much to learn from them. And that is a bridge worth building. John McCormick is an ArtsCan Circle volunteer currently acting as its Executive Director. Born in Toronto to a musical family, he spent several years touring and recording music and, following a law degree, fell in love with community development, a passion he has pursued for the past 25 years.